Introduction: Anyone who follows the B.A.S.S. Elite Series should be familiar with John Crews. 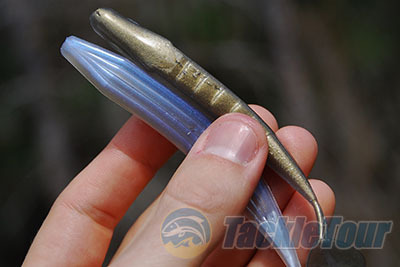 As one of the most likeable and successful guys on tour, John founded Missile Baits in 2011 in hopes of bringing anglers quality, well-thought-out tackle that will stack the odds in their favor. Being a huge soft-plastic fisherman but never having thrown anything from Missile Baits, I was amped to try their Shockwave paddle tails on some of my local waters. 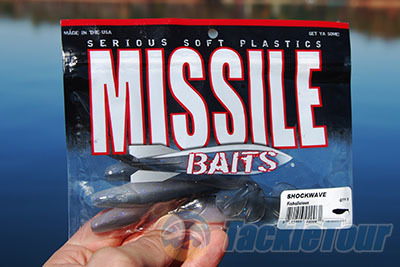 The Missile Baits packaging is displayed with beautiful Lake Lanier in the background. Quality/Construction: The three packages of Shockwaves I received for testing all easily passed the quality test without a hitch. 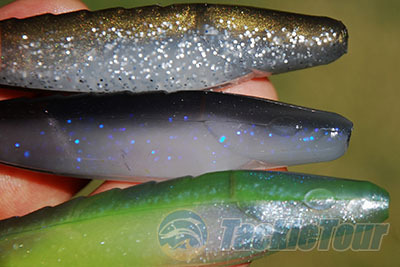 None of the baits exhibited any errors or blemishes, and the colors were all well done with a nice level of natural appeal. I find the plastic to be on the softer side, but it's still able to hold a hook nicely while preserving that all-important action and feel. 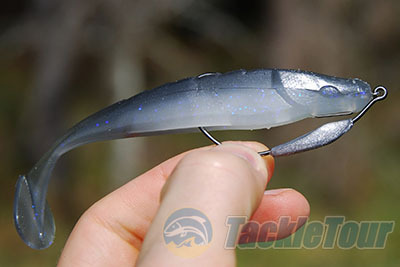 I love fishing these baits on a keel-weighted swimbait hook like the Damiki D-Hold. 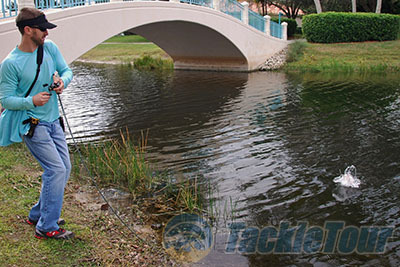 Performance: I most commonly fish a soft swimbait in shallow water on a keel-weighted 1/8-ounce 3/0 swimbait hook. While the Shockwave exhibits excellent kicking action and a good body �shimmy� on this setup, it lacks the intense rolling motion displayed by baits like Zoom's Swimming Fluke. The Shockwave sports a similar profile from the side, but its thickness is a bit less than that of a Zoom Swimming Fluke. The action of the 4.5-inch version I throw is amplified a tad when a lighter 1/16-ounce swimbait hook is used, so if maximum potential is sought you'll want to opt for the lightest rig you can get away with. Despite this, I mostly prefer to fish it on the 1/8-ounce hook since it's more versatile and it still displays plenty of action while coaxing tons of fish into committing. Bites were plentiful throwing the Shockwave on local waters. These offerings sport lively action�even on the fall�so be prepared for strikes immediately after the bait splashes down. 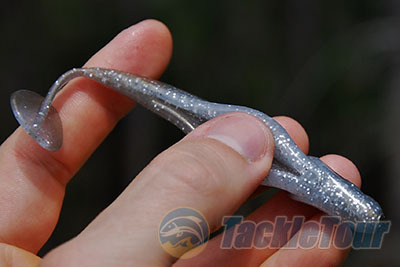 These baits cast well because they sport a relatively thin profile. I find my accuracy and distance to be very good since the wind resistance is minimal when compared to a beefier hollow-body type swimbait. The streamlined build also allows the bait to stay down more effectively on a brisk retrieve and helps it to sneak through sparse shoreline weed clumps that are so common on my small local waters. The cosmetics are done very nicely. Colors (from top to bottom) Brass Monkey, Fishalicious, Bombshell. A generous belly slit means rigging is a snap.